Epic of Gilgamesh - The first great extant work of literature in history, Gilgamesh is the epic poem of a Sumerian king who faces many adventures and trials. The most famous of which was his interaction with a savage named Enkidu who was created by the gods to kill Gilgamesh. After battling an indecisive fight, two became friends and fought against a primeval creature named Humbaba. 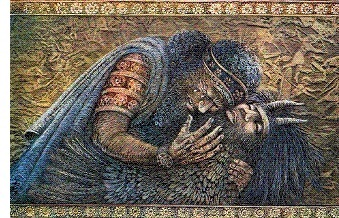 They were victorious, but Enkidu was eventually slain by the gods for failing to carry out their will, leaving Gilgamesh to mourn his friend. The Sumerian King List contains the name of a king called Gilgamesh who lived around 2600 BC, indicating that the character on which the poem is based may have been an actual person. However, the oldest surviving copy of the poem is not written in Sumerian, making its origin difficult to date. Similar to Homer's Odyssey, the fantastic nature of the hero's adventures indicates that it was most likely passed down for centuries by oral tradition before being written down.